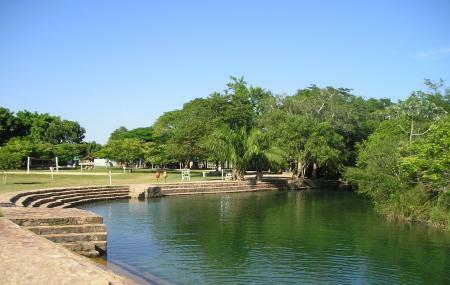 You can spend a few hours or an entire day at the Balneario Municipal. Carry a change of clothes and don’t forget to apply sunscreen. If you are a bibliophile, this is the perfect place to carry your favourite novel to! Seasonal ticket prices apply. Please check with a tour operator for the present ticket prices. Entry is free for children 5 and under. Hiring a moto-taxi is recommended. Love this? Explore the entire list of places to visit in Bonito before you plan your trip. Fancy a good night's sleep after a tiring day? Check out where to stay in Bonito and book an accommodation of your choice. How popular is Balneario Municipal? People normally club together Abismo Anhumas and Figueira Beach while planning their visit to Balneario Municipal. People also prefer to start their day with Balneario Municipal. Excellent place to spend the day if you d9dnt book any tours in bonito. Of course the water is not clear as the other spots. But nice to cool down. It was advertised as being cool to visit, but being honest, as a tourist coming to visit for the first time Bonito, my expectations were to find nature, well that didn't happen here as there are thousand of local people, and I hope I'm not taken wrong here but a touristic place does not involved be surrounded of an overcrowded place, where there was no space to sit by the river, no place to sit on the chairs, noisy, among other factors. You see only one type of fish swimming among people, but being with that many, you can't really enjoy this place. And besides that the only activities there are, either swim, sit on the restaurant or grill your own meat, and that's it. So we had to stay there without being able to do anything. If your not brave enough to get in ice cold water then all you'll enjoy is seeing the clear waters and fish. The food is delicious, but the fun is swimming among the fish. You can swim down River for 7min and you'll feel like you own the place. Because its Tranquil and no loud music playing. BRING SNORKEL! Small place, but beautiful. We visited on a cold day but still made the most of the park and had the water mostly to ourselves. Had some hot snacks in the cafe and had a family of monkeys come for a visit. I can only imagine how beautiful and refreshing it is on a hot day!